When the Serb and I decided to get hitched, his family was all in – you guessed it – Serbia and my parents were living in Kuwait for ten months of the year. Celebrating the millennium in the Cook Islands seemed like a stellar idea because, if the world was going to end (or at least come to a halt), what better place to be than a remote tropical island? I’d been a bridesmaid enough times to get the vicarious walking-down-the-aisle-all-eyes-on-me thrill but also the associated stress of planning a party for 100+ people. We decided to do the wedding alone but have a party in the summer when my parents were in town. We decided to mail announcements to our friends and family on our way to the airport letting them know that we were getting hitched (except for the parents – the Serb asked my dad for my hand in marriage 20 minutes after meeting him). I contacted an event planner named Anita who arranged everything for us. We booked an apartment in a small, family-run motel on the edge of the water. The day we arrived she showed us the perfect secluded area of beach for the ceremony and we went to meet our minister, Danny. Then all we had to do was enjoy our vacation and see Anita and Danny two weeks later. But we did see Danny again – a couple of times, actually. The first time was at a hotel where he was MC for a cultural dinner show. He spotted us right away and gave us a shout-out, which was cute, then had us come up and dance, which was less cute. The second time we saw Danny was in our room, sitting on our dresser. 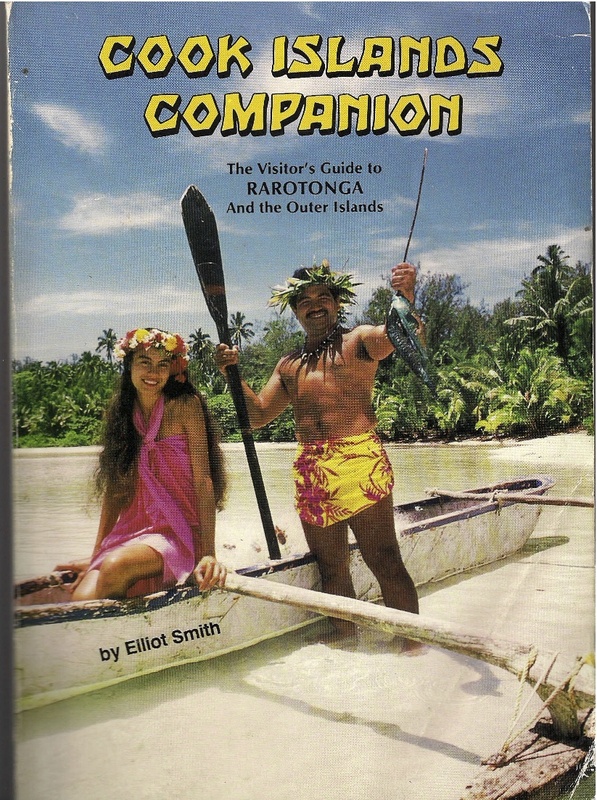 He was on the cover of our Guide to the Cook Islands, looking like one of the natives from Gilligan’s Island. Apparently our Danny was a bit of a local celebrity. On the day of our wedding, we weren’t due on the beach until sunset, so I’d booked an in-room massage to relax and pass the time. 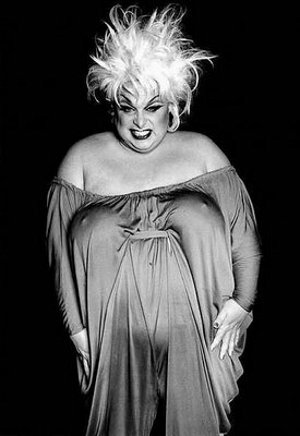 Enter Divine in a muumuu. She oiled me up, ran her hands up and down my shoulders for a couple of minutes, then asked if she could have my People magazines. After she left, I had to have a few Pina Coladas to unwind. It was time to get married. With the Serb safely ensconced at the bar, I put on my wedding dress (fifteen dollars at the mall), did my makeup (lip balm) and hair (four bobby pins). 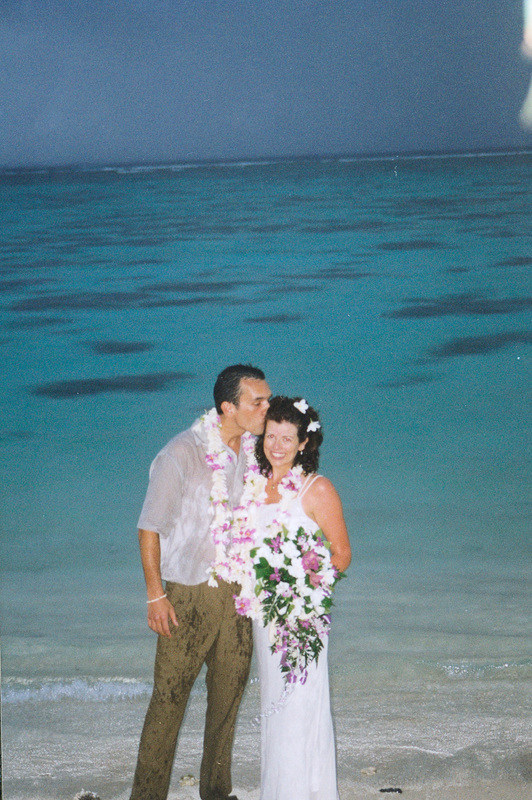 Anita showed up with a massive bouquet, out of which I plucked four gardenias to put in my hair in lieu of a veil. We didn’t have time to ponder that question because it started to rain, a blessing from the gods but not for my dress: it became completely translucent. The true blessing was having a bouquet as big as gladiator shield to hide my lady parts. It's the rain that drenched the Serb's shirt and pants, not nerves. After the paperwork was signed in a bar across the street, we took off on our scooter and toured the island in the rain, honking and waving at everyone we passed. Back at our apartment, the Serb decided to forego the traditional carrying of the bride across the threshold and instead threw us both in the pool. We ran to the beach in our towels to catch the most brilliant sunset ever, then got dressed and had a romantic dinner, where I promptly fell asleep at the table. Looking back I can see how my wedding reflects my marriage: both were full of interesting surprises, overall kookiness, lots of laughs and utter exhaustion. What a sweet story! I wish our wedding had been as laid back, but it was a typical South Asian MegaWedding and I detested every minute of it (apart from the fact that I was marrying the man of my dreams). Totally off tangent – but your parents lived in Kuwait for part of the year? Are you sure you’re not partly South Asian too???? What a great wedding story, thanks for sharing. 🙂 If I were ever to get married again THAT is how I would do it. Quiet. Relaxed. In case I haven’t told you in awhile…I love you. Hm, I wonder if I could get a wedding like that? Maybe if I negotiated taking my husband’s name? What a fun story and GREAT pic! i LOVE this story. LOVE. Awww … thats actually quite cute and funny. Aww, that’s sweet! And they lived happily ever after! Blog post title of the year so far! LMAO! Awesome story!